What's going on wrestling fans? Since then, I've been a fan, sometimes diehard, other times passing. I always preferred the NWA/WCW heyday to the WWF/WWE in any incarnation, and say ECW grow from what it was to, sadly, what it is now. 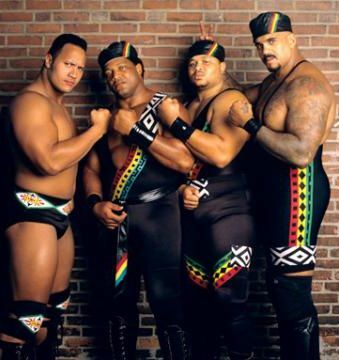 I am a Black man, and have also always had a sweetspot for Black Professional Wrestlers, from the jobbers to the true stars. This blog is dedicated to all of them. While I love reading gossip, I will never post up the results of PPV events before they happen, no matter how juicy. The name of this blog is "black rasslin'"; guys like John Cena might embrace "urban culture", but he will not be covered extensively on these pages, due to the nature of this blog. No professional wrestler is too big or too small. I will try my best to dedicate as much space to Virgil as I do to guys like Booker T, within reason. If the wrestler only has 2 years of ring history, his piece might be noticeably shorter who has spanned a decade or 2. This blog will speak the truth, no matter how vicious, but will try and refrain from profanity, out of respect for the fans who might be underage but still wanting knowledge. I am still debating on if I am going to highlight Black Pro Wrestling Managers, like Slick Rick and Teddy Long. I feel like I should highlight them, but who knows how extensive. I reserve the right to alter/amend these rules at any time. If you do not agree, or have suggestions, feel free to send me an email, with the subject "black rasslin'". Now, there is no set schedule for my posting on here, so your best bet is to subscribe to this blog's feed, and you can get the new posts when they become live. In closing, there is one thing I want to say: while this blog is dedicated to the Black Professional Wrestler, do not think that I am discriminating against White Professional Wrestlers. My love for Wrestling goes way beyond color: I have always been a fan of guys like Arn Anderson, Dusty Rhodes, Sabu, the Steiner Brothers, Chris Adams, Bret Hart... the list goes on. What I am trying to do, which I always try to do when I embark on anything, is help fill a void. Doing Google searches has only come up with a t-shirt. I feel more is needed, hence black rasslin'. Let me know what you think. nothing wrong with a likkle black rasslin'!